At 1:00 pm, the Sensex was trading 128 points higher at 38,015 level. Meanwhile, the Nifty was trading 18 points higher at 11,468 level. It hit all-time high of 11,495 level in early trade. While the Sensex has gained 11.67% since the beginning of this year, Nifty rose 9% during the same period this year. The Sensex continued its record rally in early trade and crossed the key 38,000 level for the first time ever led by a rise in banking stocks. 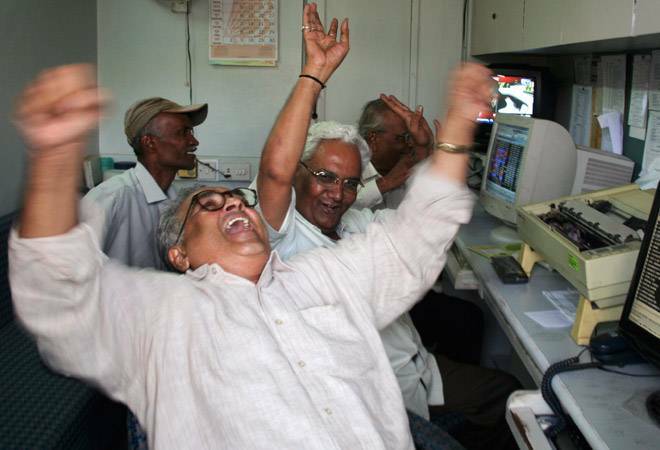 At 1:00 pm, the Sensex was trading 128 points higher at 38,015 level. Meanwhile, the Nifty was trading 18 points higher at 11,468 level. It hit all-time high of 11,495 level in early trade. While the Sensex has gained 11.67% since the beginning of this year, Nifty rose 9% during the same period this year. We look at factors why Sensex, Nifty hit record highs in trade today. An analysis of 173 companies showed consumer-oriented sectors such as auto, FMCG, consumer durables and airlines as well as commodity linked sectors like cement, iron and steel and oil and gas, saw stronger sales growth in the June quarter. Banking stocks led the charge with the bank Nifty hitting its all time high of 28,339 level. The BSE bankex too rose to its all time high of 32,106 level. The banking rally was led by ICICI Bank, SBI and Axis Bank. Bank of Baroda and PNB too were trading in the green. "The banking sector is taking the lead, so the Nifty and the Sensex are cruising" Siddharth Sedani, Vice-President, Head Equity Advisory, Anand Rathi told Reuters. "Banking sector is doing well because treasury incomes will improve on the amount given by RBI to the government, which will improve the treasury income for the banks", Sedani added. The rupee gained in the early trade today. The currency opened higher by 14 paise at 68.48 per dollar against previous close 68.62. On Wednesday too, the rupee closed higher snapping its three-day losing streak and climbed primarily due to weakness in the dollar against major currencies. The rising Indian currency helps strengthen investors' sentiment in the Indian markets. The India Meteorological Department (IMD) last week said monsoon rains would be normal in August and September, which bouyed market sentiment. In the second long range forecast for rainfall during the second half of the Southwest Monsoon season, the IMD said the scenario realised till the end of July suggests that distribution of rainfall was very good across the country except Bihar, Jharkhand and north-eastern states. The favourable distribution of rainfall was expected to continue for the next two months, it said, raising hopes for agricultural operations during the kharif season. Domestic institutional investors (DIIs) played a key role in setting record rally for indices. DIIs poured Rs 3,845 crore into the Indian market since the beginning of July. FIIs were net sellers in Indian equities since April 2018 sold equities worth just Rs 2,768.75 crore in July. The amount is far lower than Rs 9,620.56 crore, Rs 12,359.71 crore and Rs 10,249.17 crore withdrawn in April, May and June this year, respectively. The reduction in FII selling in Indian market signals the growing faith of these investors in Indian securities.